Claims of witchcraft and sorcery, firings and reinstatements – who will win the battle of wills between the Supreme Leader and President Ahmadinejad? Iranian Supreme Leader Ayatollah Ali Khamenei, and virtually the entire conservative Iranian establishment – including leaders of the Iranian Revolutionary Guard Corps (IRGC) – have unleashed a political firestorm against President Mahmoud Ahmadinejad and his closest aides. Although the battle lines were drawn many months ago, an unprecedented power struggle erupted into full public view on April 17, when Ahmadinejad summarily fired Heydar Moslehi, Iran’s intelligence minister. An hour later, Khamenei reinstated Moslehi, and the two most powerful men in Tehran began an astonishing test of wills, in which Khamenei – who commands the leadership of the IRGC, the armed forces and the paramilitary Basij, and who has the loyalty of the largest bloc of conservatives in Iran’s parliament – holds most of the cards. Within weeks, Ahmadinejad was engaged in a rearguard struggle to hold on, in the face of impeachment threats, a media onslaught, and charges from some of Iran’s most powerful cleric that he and his aides had abandoned the central principle of the Islamic Republic of Iran, namely, clerical supremacy. The conflict, according to Iran analysts, revolves principally around manoeuvring in advance of next year’s parliamentary elections, in which conservatives loyal to Khamenei plan to isolate and weaken Ahmadinejad. Beyond that, at stake is the presidential election in 2013, where Khamenei is seeking to block an attempt by Ahmadinejad to run a favourite aide to succeed him as president. While it’s by no means clear that Ahmadinejad can maintain his grip on power much longer, the turmoil in Iran also has direct implications for Iran’s relationship with the United States, the West, and the rest of the P5+1 powers who are seeking to restart negotiations with Tehran over its controversial nuclear enrichment programme. And to the extent that there are ‘hawks’ and ‘doves’ in Iranian politics when it comes to the nuclear issue, in this case the doves are actually centred in the Ahmadinejad camp. Since the presidential election in June, 2009, when Ahmadinejad emerged victorious amid widespread charges of fraud, he has consistently tried to outmanoeuvre Khamenei, seeking to accumulate power in the president’s office. Khamenei, meanwhile, has repeatedly clipped Ahmadinejad’s wings. In 2009, when Ahmadinejad sought to install a close ally, Esfandiar Rahim-Mashaei, as first vice president, Khamenei blocked Mashaei’s appointment. Although Ahmadinejad responded by naming Mashaei to the position of presidential chief-of-staff, Mashaei has since emerged as a lightning rod in the power struggle between Ahmadinejad and Khamenei. Ahmadinejad and Mashaei have been close friends and allies for three decades, since they served together in local government in West Azerbaijan in the early 1980s. Ahmadinejad’s son is married to Mashaei’s daughter. 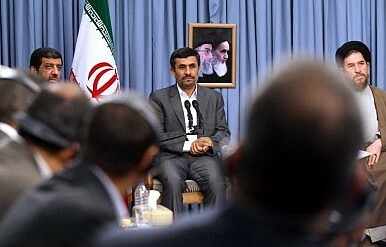 And there are reports that Ahmadinejad is grooming Mashaei to succeed him as president in 2013. A new US intelligence estimate shies from accusing Iran of restarting pursuit of a nuclear bomb. But Arab world unrest has strengthened its hand. Election Year = No Iran DealTime for West to Wise Up on IranMemo to Iran: Obama Won’t Let It GoIs Iran Ready to Compromise?US Hardliners Lose Ground on Iran?